Dragon (ドラゴン Doragon) is a Type of Monster representing mythological serpentine, reptile, avian like beings that are typically fire-breathing creatures that symbolize chaos, evil, fierceness and intimidation. Dragons tend to be the strongest or key boss monster in numerous Deck types in addition one of the most established and powerful Monster Types in the entire franchise. Ever since the Yu-Gi-Oh! Trading Card franchise began, Dragon monsters have been known for having an ATK power greater than any other type of monster in the game in addition to being the one of the most popular monster Types. In most of the Yu-Gi-Oh! anime and manga series, the main character's rivals usually use Dragon-Type monsters as their signature or boss monsters, and to varying degrees in their Decks. Seto Kaiba employs his signature "Blue-Eyes White Dragon" as a key boss monster while his deck in the later part of the anime incorporates a variety of Dragons such as Spear Dragon, Different Dimension Dragon, Paladin of White Dragon and the Chaos Emperor Dragon. 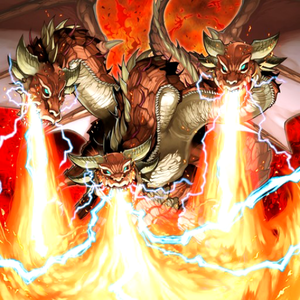 Chazz Princeton uses "Armed Dragon"s as a core part of his Deck in the anime, and a Dragon Deck in the manga spearheaded by "Light and Darkness Dragon". Jack Atlas's Turbo Deck is based on summoning his "Red Dragon Archfiend" while his Ground Deck also plays numerous Dragons like "Strong Wind Dragon", "Vice Dragon", and "Exploder Dragonwing". Kite Tenjo uses "Galaxy-Eyes Photon Dragon", in addition to some minor Dragon monsters. Curiously enough, this tradition was inverted in the fifth series, and the protagonist Yuya Sakaki, along with his counterparts, use Dragons, primarily "Odd-Eyes Pendulum Dragon"; his main rival Declan Akaba uses no Dragons whatsoever. Varis primarily uses a "rokket" Deck, which includes other Dragon monsters, and all of his ace monsters are based on Dragons, though only one, "Borreload Dragon", is a Dragon. There are Dragon-Type Monsters for every Attribute (except DIVINE, even though all Divine-Beast-Type monsters except "Obelisk the Tormentor" are referred to as dragons). 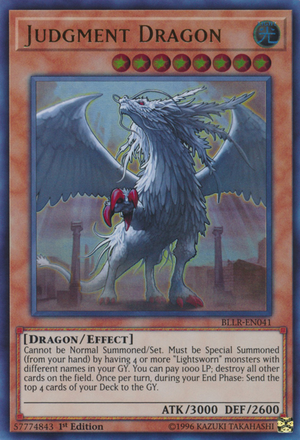 Some of the most powerful Fusion, Synchro, Xyz, and Pendulum Monsters are Dragon-Type monsters, including include "Five-Headed Dragon", "Dragon Master Knight", "Blue-Eyes Ultimate Dragon", "Stardust Dragon", "Black Rose Dragon", "Trishula, Dragon of the Ice Barrier", "Shooting Quasar Dragon", "Beelze of the Diabolic Dragons", "Void Ogre Dragon", "Number 107: Galaxy-Eyes Tachyon Dragon", "Number 95: Galaxy-Eyes Dark Matter Dragon", "Odd-Eyes Pendulum Dragon", "Dark Rebellion Xyz Dragon", "Clear Wing Synchro Dragon", "Odd-Eyes Rebellion Dragon", "Crystal Wing Synchro Dragon", "Starving Venom Fusion Dragon", and "Supreme King Z-ARC". Archetypes include: "Majestic", "Hieratic", "Horus the Black Flame Dragon", "Blue-Eyes", "Red-Eyes", "Galaxy-Eyes", "Odd-Eyes", "rokket" and "Dragon Ruler". This last one is one of the most powerful series in the game; even after becoming Limited on the January 2014 Lists, they were still a power to be reckoned with, as each dragon could offer support to Decks of its corresponding Attribute, giving them more consistency. The release of "Number 95: Galaxy-Eyes Dark Matter Dragon" sealed their destiny and made them become Forbidden. "Ice Barrier": "Trishula, Dragon of the Ice Barrier"
"Iron Chain": "Iron Chain Dragon"
"Koa'ki Meiru": "Koa'ki Meiru Maximus"
"Utopia": "Number 99: Utopic Dragon"
Some dragon Decks are based on the "LV" Dragons, "Armed Dragon" and "Horus the Black Flame Dragon". These Decks usually focus on leveling up their monsters quickly. To protect the high level monsters from Trap Cards, "Royal Decree", "Jinzo", "Trap Stun", "Mirage Dragon" or "King Dragun" are used. "Horus the Black Flame Dragon" has added protection from Spell Cards and is well known for the infamous "Horus Decree" lockdown. "Horus" and "Armed Dragon" cards can even be combined to make a Deck that not only locks down Spell and Trap Cards, but also controls the opponent's monsters that may get in your way. These types of Decks often focus on getting Fusion Monsters like "Five-Headed Dragon", "King Dragun", "Blue-Eyes Ultimate Dragon", and sometimes even "Dragon Master Knight" or Blue-Eyes Shining Dragon to the field. Usually "Dragon's Mirror" or "Future Fusion" is used to accomplish these tasks. If you want to summon "King Dragun" quickly, "The Dark - Hex-Sealed Fusion", along with other substitute Fusion-Material monsters, can be of great help. One of the more popular builds in the game, this deck utilizes a combination of Chaos monsters and "Red-Eyes Darkness Metal Dragon". This build focuses on getting out "Red-Eyes Darkness Metal Dragon", "Lightpulsar Dragon", and "Chaos Sorcerer"/"Black Luster Soldier - Envoy of the Beginning"; its main offensive strategy relies on banishing opposing cards or banishing its own cards in order to Special Summon its key monsters. One can use "Raiden, Hand of the Lightsworn", "Lyla, Lightsworn Sorceress", "Card Trooper" and "Darkflare Dragon" to send monsters to the Graveyard to summon "Lightpulsar Dragon", or to speed up the setups for summoning both "Dark Armed Dragon" and/or "Black Luster Soldier - Envoy of the Beginning". If played correctly, this deck is capable of Special Summoning its most powerful monsters within a few turns. This deck relies heavily on Special Summoning powerful monsters with devastating effects in order to overpower and OTK the opponent. The deck can also create Level 8 Synchro monsters consistently due to the synergy of "White Dragon Wyverburster", "Black Dragon Collapserpent", "Raiden, Hand of the Lightsworn" and "Plaguespreader Zombie". "Lightpulsar Dragon", "Caius the Shadow Monarch", and "Chaos Sorcerer" also open up Rank 6 plays after their effects are used. Perhaps the easiest way to play Dragons, this deck focuses on sending powerful dragons to the graveyard with cards such as "Dragon Ravine"/"Dragon Shrine" and "Number 95: Galaxy-Eyes Dark Matter Dragon", then proceeding to revive them with cards such as "Soul Charge" and "Return of the Dragon Lords". Many support cards for this deck exclusively support Normal Monsters, as a result, it is often best to play this deck with Dragon-Type Normal Monsters. Due to the extreme ease with which a player can swarm the field with high-level dragons, Xyz Monsters(Rank 7-8) are highly recommended in this deck.Cards such as Decoy Dragon and Red-Eyes Darkness Metal Dragon are useful as both can summon any Level 7 or higher Dragon-Type monster from your Graveyard.